Fierce competition in global markets, high expectations from customers, rapid deliveries and the need always to be informed have brought the mapping of the logistics chain into the foreground when making business decisions. CargoSoft Global Logistic Access (GLA) succeeds in addressing these aspects, displaying them for all partners involved using a system that is transparent and “just in time”. 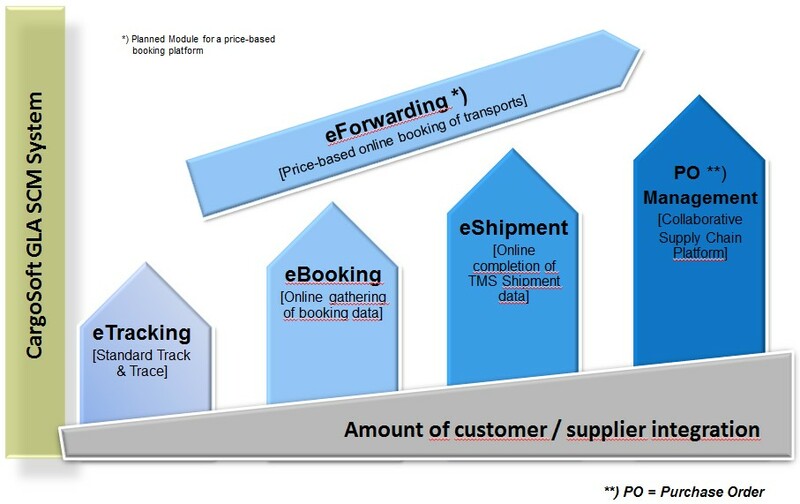 By employing internet-based technologies, each individual step of the transport process, beginning from purchasing and continuing to distribution is visualised. This makes it possible to monitor the procedure so that co-ordinating every step in the the process becomes much easier for all partners. The early warning system informs you of unforeseen occurrences. Generate different reports including Excel documents, and use the automatic e-mail sending of select data such as number of units, prices etc. Using XML interfaces you can collect data in any format from partners’ systems and combine them. Determine costs for the complete supply chain and detail them for individual sections. Delegate tasks with the task manager. Use the reporting service to forward important information to partners or to communicate “live” over the integrated chat tool. Print globally uniform barcode labels. With the integrated e-file all documents are stored effortlessly – global access is guaranteed. Configure your own screen with the contents which are important to you. Internet-based CargoSoft Global Logistic Access is available to you at Web 2.0 or Ajax, and it can be employed as an integrated solution in CargoSoft TMS or as a stand-alone product as an independent system. Optimise your planning with Global Logistic Access and regulate capacity utilisation by being informed early of all activities.